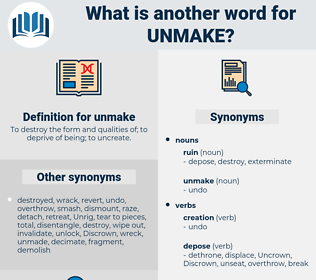 What is another word for unmake? 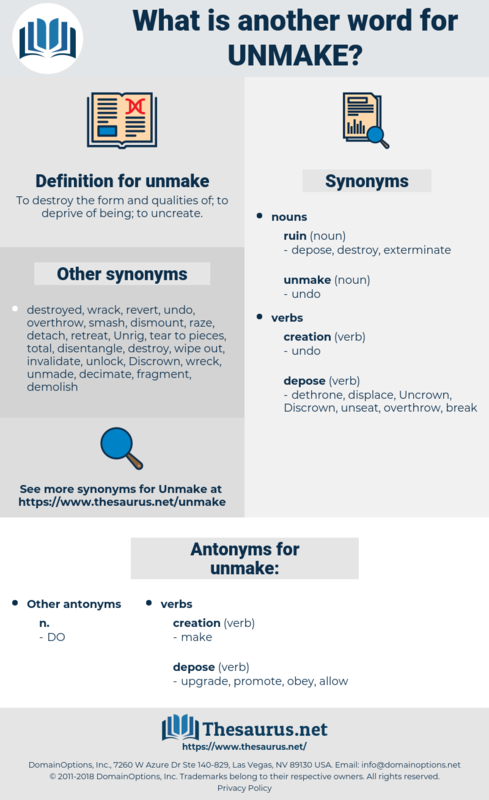 To destroy the form and qualities of; to deprive of being; to uncreate. crown, enthrone, put in power. leave, retain, keep, accept, hire, engage, employ, hold, stay, welcome. begin, restore, permit, collect, unmix, support, marry, appear, unite, construct, start, establish, institute, grow, approve, assemble, build, fix, assist, continue, gather, put together, help, solidify, validate, repair, resolve, sanction, maintain, combine, aid, join, coagulate, create, bear, increase, open, improve, integrate, develop, concentrate, rise. inaugurate, install, induct, initiate, invest, throne, baptize, elect. Further, the prince is compelled to live always with the same people, but he can do well without the same nobles, being able to make and unmake them daily, and to give or take away authority when it pleases him.